WARNING: This gene causes many digressions. You might need a discussion map to keep track. Here it is. Figure 1. 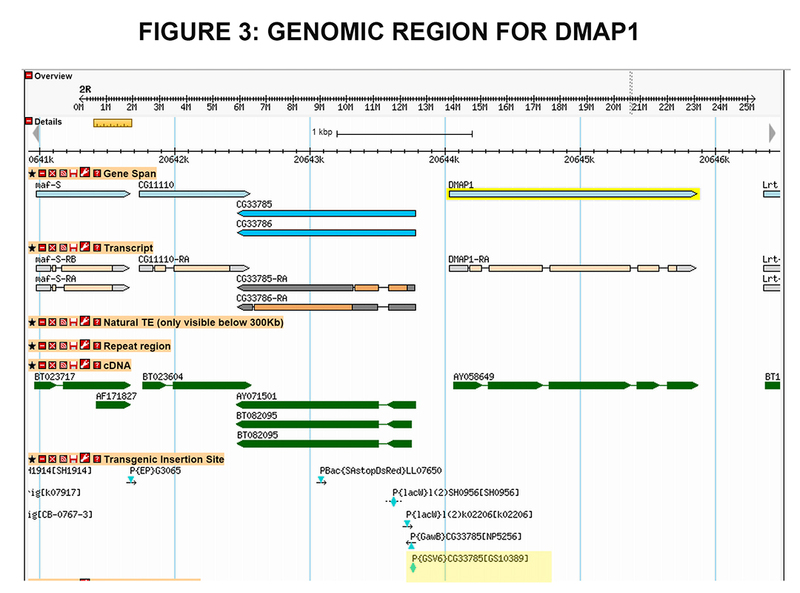 DMAP1 is a rather interesting “under the radar” gene. I always like those kinds of genes, or projects, that no one in their right mind would tackle. They represent small spaces in a very crowded research field that people without much cash can try and work on. I say “under the radar” but that is not true for research using mammalian models. DMAP1 was originally discovered in 2000 (PMID: 10888872) and ever since then has been quite extensively studied in mice and mammalian cell culture. DMAP1 interacts with a variety of other proteins to form transcriptionally repressive complexes that remodel chromatin by modifying histones and DNA (TIP60-p400 AKA NuA4 PMID12963728). A mouthful of acronyms. In fact, this protein crops up in both signal transduction papers and chromatin papers, both subjects that are THE WORST acronymic offenders. Perhaps it is worth spelling some of them out (hence, the digressions). The TIP60-p400 complex is essentially the same thing as the NuA4 complex – a nucleosome remodeler. (TIP60 nomenclature from flies and humans, NuA4 from yeast). A kind of chromatin snow plough that uses ATP hydrolysis to shift nucleosomes around the DNA, in order to expose sequences that are important for gene regulation. (Always remember that when controlling gene expression in eukaryotes, you have to contend with the occluding effects of chromatin. Here is an excellent review about the eukaryotic chromatin paradigm: an oldie but a goodie PMID: 10412974) Chromatin remodelers are remarkable molecular machines, very complex with multiple subunits (“rabbit dropping” diagrams often used to explain them), and intriguing interactions with actin molecules IN THE NUCLEUS (PMID: 11880634; highly relevant for discussions relating to a putative nucleoskeleton….another story). Here is a nice, comprehensive review about chromatin remodeling in general: PMID: 21358755. Anyhow, this TIP60/NuA4 complex interacts with DMAP1 and another acronym, DNMT1, to function primarily in transcriptional repression by histone modification (PMID: 14978102), heterochromatin formation (PMID: 14665632), imprinting and stem cell pluripotency (PMID: 21383065) and repair of double stranded DNA breaks via the homologous recombination pathway (PMID: 19845771, PMID: 20864525). So, DMAP1 is a busy molecule. DMAP1 stands for “DNMT1 associated protein 1” (an acronym that stands for another acronym). DNMT1 is a DNA methyltransferase – if there are two halves to epigenetic regulation (i.e., regulation of gene expression by chromatin structure) – one would be histone modifications (acetylation, phosphorylation, methylation etc) and the other would be DNA modification – exclusively at this time, methylation. Methyl groups are added to the 5’ carbon of the cytosine ring (we are talking vertebrates here). The enzymes that transfer these methyl marks are called methyltransferases, and they are either de novo methyltransferases (creating a new pattern of methyl marks on the DNA) or maintenance methyltransferases (that maintain an existing pattern). DMAP1 was identified as a molecule that interacts with DNA methyltransferase 1 (DNMT1) – a maintenance methyltransferase. So all that epigenetic stuff the NuA4/Tip60 complex does – histone modifications and the like – is presumably engaged in cross talk with DNA modifications via DMAP1 and DNMT1. Oh dear this is a huge subject which threatens to go off the rails so let me just refer you to an interesting review about DNA methylation patterns across species, what it’s good for, how it might have evolved etc. (PMID: 18463664). Then, recently – about six months ago – DMAP1 shows up in a much more convincing context, as a regulator via chromatin structure of signaling pathways in innate immunity in Drosophila. Yey! Which of course necessitates a brief description of innate immunity. What is innate immunity? Let’s start with immunity. Most of us recognize this to mean our humoral and cellular immune system which detects antigenic substances like viral coat proteins, bacterial cell wall components, pet dander, food allergens (for those of you with peanut sensitivity check out this recent discovery: PMID: 25592987)…this remarkable system is adaptive…when presented with an antigen (literally, an antibody-generating substance) the immune system can recognize it, send cells out to engulf and destroy it, and stick bits of the antigen onto the surface of specific cells that provide a long term reminder of the antigen so the response is quicker and bigger the next time the body is exposed to that antigen. Sometimes the response needs priming (hence, booster shots). Sometimes, people produce an exaggerated response which can be lethal (allergies to bee stings, or certain foods for example). Sometimes people can be attacked by their own immune systems (as in autoimmune disorders like Lupus). The vertebrate immune system is very complicated. There are a large number of specialized cell types involved, which are part of the blood system, itself built on antibody/antigenic relationships. The genetics of the immune system are wild and crazy…something I really enjoy teaching in my advanced classes, research that garnered a Nobel Prize (Susumu Tonegawa 1987, check out Nobelprize.org). A deeper and more mysterious question relates to the evolution of the immune system…connected perhaps to the unfolding stages of development in metazoans (multicellular organisms) where within one individual, tissues become increasingly differentiated from each other. What then is innate immunity? In short, whereas the adaptive system I’ve just described is highly specific, innate immunity is non-specific – a first internal line of defense (underneath the skin and mucosal epithelia) that produces a range of antimicrobial peptides and chemicals that enhance an inflammatory response. Mediators of this inflammatory response include the cytokines you might have heard of, which are a little bit like hormones – small molecules that diffuse quickly through the blood stream and into cells. Adaptive immunity and innate immunity work together to mediate a response to injury or infection – innate immunity works fast (matter of hours – think how quickly bacteria reproduce!) while the adaptive system takes longer (days). The word “innate” is also meant to describe the fact that this early response system is shared across major phyla – both vertebrates and invertebrates. But only vertebrates have adaptive immunity. Thank goodness we’re vertebrates. So fruit flies are protected by an innate immune response. There are two parts to this response. 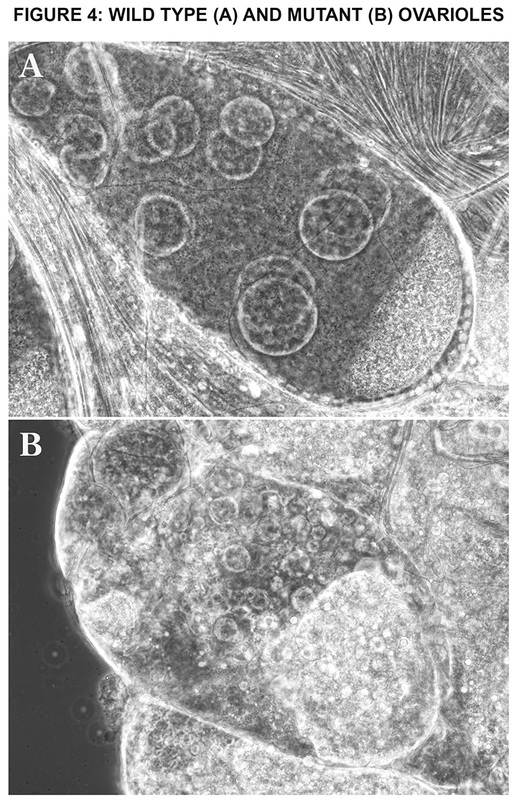 First, a cellular response, where cells circulating in the hemolymph (fly blood) recognize and engulf invading pathogens. Secondly, a humoral response from the fat body (serves as a lymphatic organ among other things) where a signaling cascade releases certain transcription factors from inhibition in the cytoplasm so they can migrate into the nucleus and promote the expression of genes that result in an increased synthesis of immunity-generating peptides that can destroy the invading pathogens. This business of a ligand-binding-to-a-receptor-and-releasing-a-transcriptional-regulator-from-inhibition is a common backbone for pathways that regulate cytokine synthesis in vertebrates AND innate immunity in flies AND…drumroll please….egg polarity in early fly development. Pardon? In one of those wonderful twists of evolutionary fate, the same pathway that specifies patterning in the Drosophila egg is used again to regulate immunity. This kind of retooling is not uncommon. It reminds me of two important quotes: one comes from Theodosius Dobzhansky, who famously pointed out that nothing in evolution makes sense except in the light of evolution (American Biology Teacher 35 (3): 125–129). Another quip comes from a colleague who shall remain nameless unless I am instructed otherwise (you know who you are RSH) but I modified it – evolution is not a German engineer making a Mercedes, but in fact a teenager with a broken car and no money. Just gotta get to the next generation, and if you have to jerry-rig it, so be it, deal with it later. I have tried to depict the relationships between these signaling pathways in Figure 2, but this is of course grotesquely simplified. Also these pathways probably talk to each other as well – which I didn’t show in my figure: here is a decent review: PMID: 21209287. So NOW can we please get back to DMAP1? Yes! Because about six months ago, a paper was published that I think convincingly points to a biological function for this gene in flies. Here is the paper: PMID: 24947515. 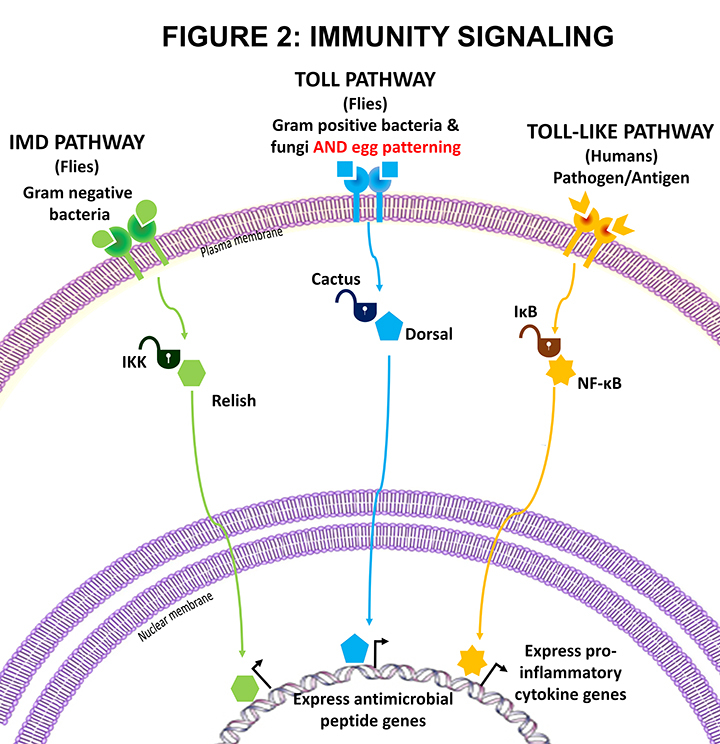 In sum, these researchers showed that DMAP1 interacts with Relish which if you take a look at my Figure 2 is in one of these related pathways that regulates innate immunity. The same researchers had earlier published a high through-put proteomic paper in which they identified hundreds of potential interactors with components of these signaling pathways and this DMAP1 paper represents a detailed confirmation of this specific interaction (by other methods – QPCR and coimmunoprecipitation analyses) and takes a stab at a mechanism by using a genetic approach – knocking down DMAP1 expression first in cell culture and then in living flies. They also discover connections with other chromatin remodelers – notably the Brahma complex (NO NOT ANOTHER DIGRESSION) and suggest that DMAP1 may be involved in modulating the specificity of the response from these pathways in development. This is a signal transduction thing – multiple inputs get integrated and turned into specific responses. DMAP1 may play a role in the specification of response. The mechanism is still pretty vague (isn’t it always…don’t you love it when a reviewer sends back a 23 page manuscript with seventeen expensive experiments and asks “please establish a mechanism beyond all reasonable doubt. Have a nice day). 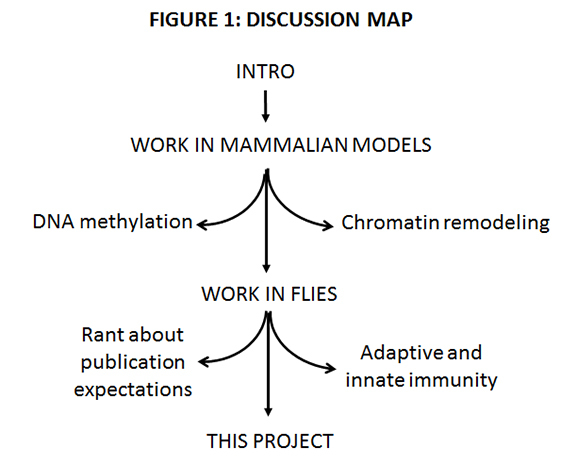 The notable thing for ME about this paper concerns the lengths they had to go through in order to knock down DMAP1 in flies. What they needed was a nice clean mutation in the gene. There isn’t one. Well, there are P element hits but they are all in the wrong place. These researchers used transgenic RNAi and the UAS GAL4 system combined with an inducible inhibitor to control when and where DMAP1 was knocked down (I’ll explain the UAS GAL4 system later – another nose bleeder). I always liked this gene because…well it’s under the radar as I said, but also because I am curious about what a DNA methylation associated protein is doing in flies, since flies do not have the same degree of methylation as vertebrates (see digressions above). I want to make a mutation in this gene. But LOOK at the configuration of the one potentially useful P hit that’s available (highlighted in yellow): it is in the 5’ UTR of the upstream gene (Figure 3). If I try to make an excision, I’ll probably knock out the upstream gene CG33785, not DMAP1. No wonder there is no mutant. Ah! The perfect project for a masochistic geneticist! I guess I could do a screen with a mutagen but I have no idea of phenotype. Well that’s not strictly true – like the authors of this paper, I used an RNAi stock from Vienna (PMID:17625558) and a ubiquitous driver and it was lethal. I also had three different RNAi lines for the upstream gene and with the same ubiquitous driver, the flies were perfectly viable. So lethality is likely a phenotype. So something like an EMS screen over a deficiency is a possibility, but there is another way too, which makes use of the P element. And for this I have enlisted the collaborative support of a colleague at SFU, also a masochist, who also teaches genetics, but she teaches a LAB as well as a lecture, so can enlist the awesome power of undergraduates to do the boring stuff (undergrads: it is good for you). In fact, she has been doing this for some time now– using the P element in the upstream gene in a male recombination scheme to select for imprecise excisions in the direction of DMAP1. She has incorporated this experiment into several semesters of her genetics lab course. We now have several lines that we are going to characterize. I will let my colleague talk about the screens, and the results, but I can tell you that there are viability AND fertility issues, and just this weekend I yanked out the ovaries from heterozygous females and their escaper (homozygous mutant) sibs and as you can see (Figure 4), the ovaries are pretty messed up. Apparently this line doesn’t even lay eggs – I am not surprised. The liberating thing about putting all this into a blog that well over three people might read is that I can make wild leaps in possibly the wrong direction! Here is a wild leap. The microscopy supports a role for DMAP1 in these retooled pathways for immunity and the specification of egg polarity! Sounds GREAT doesn’t it! At this point the sky becomes the theoretical limit but cash flow may bring that down a tad. Should also point out that the chances of doing any of this in order are pretty remote.